On Thursday, August 29th, fast-food chain workers conducted strikes in nearly 60 cities asking that chains like McDonalds (MCD), Burger King (BKW), Wendy’s (WEN) and Yum Brands (YUM) (which holds KFC and Taco Bell) boost their minimum hourly pay to $15/hour. Meanwhile, the saga between Walmart (WMT) and the D.C. City Council continues with Mayor Gray having 10 days from August 30th to sign or veto legislation which requires Walmart (WMT) to pay a minimum wage of $12.50/hour while other employers are only required to pay the D.C. minimum wage of $8.25/hour. In 1980, wage earnings as a percent of Gross Domestic Income (GDI, the sister concept to GDP) were 49%. In the last GDI report, they were closer to 42%. Meanwhile, corporate profits are up 50% from about 8% of GDI in 1980 to about 12% today. There is no doubt that the income gap between the rich and the middle class is growing. 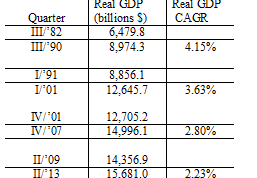 The accompanying table shows the Compounded Annual Growth Rate (CAGR) of Real GDP (as “officially” measured) from the bottom of each of the last four recessions to the following peak. It is notable that the CAGR of Real GDP in today’s recovery (2.23%) is about half the pace in the recovery from the recession of the early ‘80s. Note that in each subsequent cycle since 1982, GDP’s CAGR has slid more than 50 basis points. In the mid-90s it was determined that demographics would become an issue regarding the cost of social programs like Social Security and Medicare. So, the CPI formulation was changed so as to slow down the “official” rate of inflation, which, in turn, slowed the cost of the social programs. But there was also an unintended consequence, one not recognized by any politician or the main stream media today. 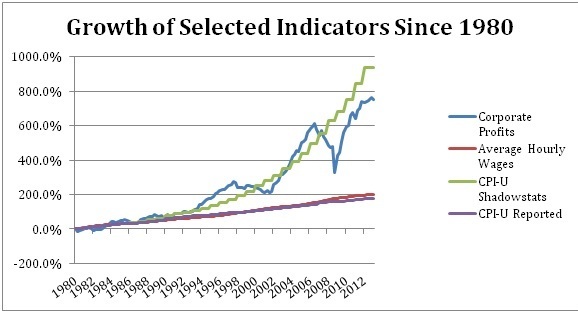 Because the “official” CPI is widely accepted as “the” measure of inflation, and because “cost of living” raises for most of middle America are based on it, its manipulation over time has lowered the real incomes of wage earners (the middle class) with the resulting negative impact on the CAGR of Real GDP, because if the prices of goods and services are actually rising faster than incomes, then aggregate demand is negatively impacted. I first published the accompanying graph on August 12th at TheStreet.com (“CPI Manipulation Has Exacerbated the Income Gap”). The graph shows the growth rates in the official CPI, Average Hourly Earnings, Corporate Profits, and the Shadowstats (John Williams) computation of inflation. As you can see from the graph, wages have only kept pace with “official” CPI, but corporate profits have grown more in line with the Shadowstats inflation rate (SGS Alternative CPI, 1980-based), interrupted only by an occasional recession. There are several private sector measurements of true inflation including that published by John Williams. In each private sector survey, the cost of living is shown to be rising significantly faster that the “official” CPI. If the “official” CPI had accurately reported inflation over the past 20 years, it is likely that wage rates today would be significantly higher, that wage earnings would command a larger percentage of GDI, that aggregate demand would be more robust because a larger share of income would be in the hands of those with higher marginal propensities to consume, and that GDP would be growing faster. For those in Washington D.C. waiting for Mayor Gray to make a political decision about wages for Walmart (WMT) employees, and for those disgruntled fast-food workers who conducted strikes in 60 cities in late August, be careful who you blame. The federal government has the power to remedy the wage situation and the income gap simply by being forthright about the real rate of inflation.